German sculptor Reinhard Klessinger’s entire career has been concerned with a variety genres, ranging from installation, sculpture and drawing to filmmaking and artist books. Having attended St. Martin’s School of Art in 1968-70, where he met Alberto Carneiro, Klessinger soon showed a tendency towards the use of contrasting materials, such as stone, glass, written words and images, while exploring the boundaries of traditional sculpture. This has often led to installations in which minute perception gestures and body movements are used as the backbone of the piece’s spatial and conceptual organisation. 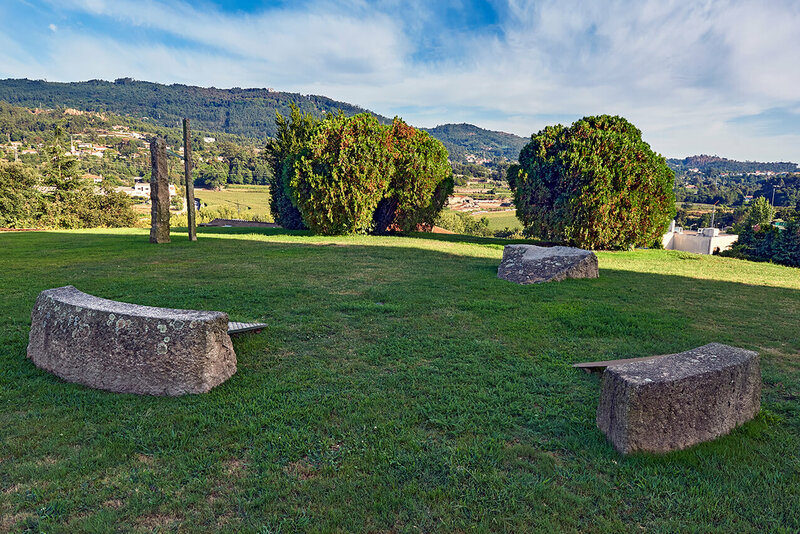 The sculpture exhibited in Santo Tirso is consistent with Klessinger’s previous work, encouraging the interaction between contrasting materials — iron, glass and stone. These local elements of ancestral resonances establish a complex relationship and generate a particular environment, prone to a symbolic experience of space, like the initiation circles of prehistoric cromlechs, where rough menhirs stand upright in circles, ellipses, rectangles or semicircles for the worship of stars and nature. Many different readings are suggested by Reinhard Klessinger’s A natureza da pedra [The nature of stone]. By opposing the rough brutality of some materials to the weightless delicacy of others, the low stone wall and the iron and glass slanted surfaces create an atmosphere reminiscent of religious rituals and tribal gatherings.